We can all relate to the feeling of searching intensively for something. Perhaps it was a lost set of keys, a treasure hunt, Easter eggs, a life partner or even "Where's Waldo?" While these searches take time, focus and effort, imagine if what you were looking for was something more sublime than your car keys or a dyed egg. What if you were searching for someone you believed was promised in religious scriptures throughout recorded history and who would provide a massive impetus to move the human race to an entirely new level of spiritual and social development? It's not someone most people consciously search for nowadays on a regular basis, but in the mid-1840s -- in America, in Europe and in the Middle East -- whole groups of people were on the concentrated lookout for just such a Figure. In May 1844, a young religious student named Mulla Husayn from Bushruyih in Persia (now Iran) was in the middle of an intense 40-day period of inner turmoil, fasting, prayer and search. He had spent years of his life anticipating and preparing himself to find this Promised One whom he expected would come during his lifetime. While on a journey, he recounts how he felt "drawn as if by a magnet" to the city of Shiraz. A few hours before sunset on May 22, 1844, he says his eyes fell suddenly upon a "youth of radiant countenance" who extended a warm invitation to visit him in his home. This youth was Siyyid Ali Muhammad, who later that evening asked Mulla Husayn to give him a list of the signs of this promised Figure he was so intensively searching for. After describing the list, Siyyid Ali Muhammad stunned his guest by saying: "Behold, all these signs are manifest in me!" Mulla Husayn described that evening afterwards: "I sat spellbound by His utterance, oblivious of time and of those who awaited me ... All the delights, all the ineffable glories, which the Almighty has recounted in His Book as the priceless possessions of the people of Paradise -- these I seemed to be experiencing that night." That night marked the beginning of a process that has since spread from a small room in Shiraz to more than 200 countries and territories of the world. That first follower of Siyyid Ali Muhammad -- the young Persian, Mulla Husayn -- has multiplied to more than 5 million people representing the diversity of the human race, from a Romanian Queen, to a Samoan King, to Eskimos, to Kalahari Bushmen. Siyyid Ali Muhammad soon after took the title of "The Bab," which in Arabic means "the Gate." He was the first of two prophetic figures who founded the Baha'i Faith, the other being Baha'u'llah, which in Arabic means "The Glory of God." The day after that conversation in Shiraz, Samuel Morse sent the first telegram from Washington, D.C., to Baltimore with the famous four words: "What hath God wrought?" Since that time, the world has contracted into a neighborhood with the rapid advance in communications technology and transportation. With it has also come an intense search by people of all races and nations for a unifying vision of the nature of human beings and society for this stage of history. During the 20th century, for example, vast numbers of people experimented with ideologies such as communism, extreme nationalism and fascism, racial superiority and materialism, just to name a few, hoping that these would provide the vision and worldview they were looking for. The search continues. 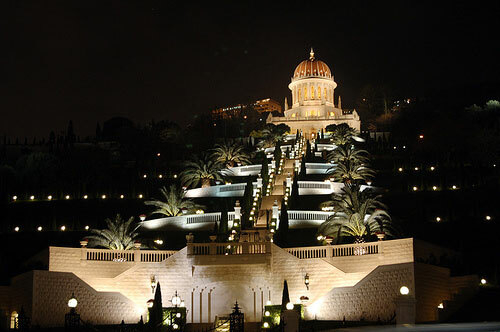 On the night of May 22 this year, Baha'is around the world will hold celebrations to mark the 168th anniversary of that first evening in Shiraz when their Faith began. The celebrations usually include prayers, readings, story-telling of the events associated with the Declaration of the Bab, and often the recitation of a special prayer for Holy Days. On May 22, this special prayer will be read close to two hours and 11 minutes after sunset -- the moment when the Bab informed Mulla Husayn of his mission. The participants will also no doubt reflect on the extraordinary chain of events that led from a single conversation in faraway Persia to their gathering together around the globe to celebrate it now. And while reflecting on the intense search by Mulla Husayn, they will also reflect on their own process of searching for spiritual answers, and that of people everywhere. If you are curious to learn more about the celebration of the Declaration of the Bab in your area, just contact the Baha'is where you live for more details as these celebrations are open to all.